So this is what can happen to a kid who was terrorized by her brother: Susie Moloney, who was "always a scared kid," became a horror writer. I've always wondered where the spine-chilling tales of horror writers come from. Since I'm too afraid to read most of this stuff, and I still haven't gotten over The Exorcist, my curiosity is what has me out to interview Susie Moloney, whose latest horror novel is called The Dwelling. 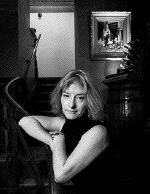 Winnipeg-born Moloney was on Manitoulin Island in 1996 when she wrote her most famous novel, A Dry Spell, which has been published in some 18 countries and has netted the petite blond about $2-million. "I don't want to talk about money -- that's not what I'm all about," she tells me nervously, more frightened of money than the ghosts that float through her books. A Dry Spell and Moloney became a bit notorious when Tom Cruise bought the film rights shortly after the book hit the shelves. Of course, I want to know how much Cruise paid, but she won't divulge. After considerable prodding, and some guessing, she concedes that the amount was somewhere in the US$500,000 range. The way it worked, Moloney says, is Cruise paid for the option to the film rights for two years. But after that time expired and the film hadn't been made, the rights went up for sale again and have been sold twice since. Moloney says each time they were sold, she was paid. "But the value goes down with each sale," she says. "It's like if you don't get married by age 40, the quality of your boyfriends begins to drop." The 41-year-old tells me she is happily married but lives apart from her husband. "It works for us," she says. "I need independent time, and that's hard to get in daily life. People get caught up in taking out the garbage and cleaning up the crumbs -- it's a romance killer. It's a better romance at a distance -- everyone knows that. Even when my husband comes to my place in the city to visit, we still have separate bedrooms." Finding success and Tom Cruise wasn't easy. Moloney's first book, The Pack (1990), about wild dogs, was never published. "It's not publishable," she says honestly. "It's a drawer book -- it stays in my drawer." Her first published novel, Bastion Falls, "was a very small book, published by Key Porter. Good characterization, but awkward structure," she admits. Wondering if horror writers are as neurotic as the rest of us, I ask her if she's superstitious. "I am superstitious about pushing my luck," she says, "I don't like to get too comfortable. In my past lives, I must have been a tortured prisoner, or a slave," she laughs. And in this life, there were some minor tortures as well. "I was always a bit of a scared kid," she tells me, "monsters under the bed and all of that." And she had an older brother who liked to terrorize her. "Once, when I was home alone at age 12, he and his buddy were at the window wearing masks -- I'll never forget it." She also mentions her mother, a big fan of horror flicks, who passed away when Susie was only 11. "Sometimes she would wake me up at night when she got too scared watching horror movies alone," she says. "I loved it when she did that. My mother was fascinated with horror." We decide that her mother is the inspiration for her books. "But where do the ideas come from?" I want to know. "What you do," she explains, "is think of your worst nightmare. And that's what I write about. For example, if you hear your child coming to your bedroom in the middle of the night, what is the first thing you think about?" "That someone will grab him," I suggest. "Or that he'll fall down the stairs on his way," she offers. "Or when your child is outside and you can't see him, then your imagination goes. You start thinking, 'Is the neighbour's dog inside?' and that kind of thing." "Wouldn't you worry more about kidnappings?" I ask. "In Winnipeg?" she says fearlessly. "I'm far more frightened about my kids entering into a bad emotional state, like low self-esteem or drugs. It's much worse than anything that can happen to you physically, because most of that can be easily fixed. The real horror in my characters is loneliness, being lost. My characters are deeply troubled, they go through emotional despair. But in the end they are altered, changed, so that they can move on with a clean slate." Her worst fear, she says, is failure, and that comes through in her books. "All my characters are failing at something. In my case, I'm afraid of being a bad mother or a bad person." Moloney, who says she really does believe in ghosts, wrote the spooky material for her latest book late at night, after her son was asleep. "I write in a long enclosed porch, always at night. I usually start at about 10:30 p.m. and work until about 12:30 a.m. I'm a frugal girl, so I always have all the lights off in the house except for the light in my bedroom." But "sometimes, when I'm writing about a ghost, I start to freak out, and then I'll let out little shrieks as I run around turning on all the lights." She says the ghost she put in the attic in The Dwelling has had an impact on her. "Now when I'm at home," she says, "I keep listening for sounds from my attic." Her eyes widen. I'm just glad I don't have an attic. She admits there is one thing that even she is too frightened to write about. "I won't write about the Devil. He really terrifies me. I won't do it because I feel I would be inviting something evil into my life."